Okay, so let's be honest: the last two Thor movies weren't all that great. While I found certain charms in both Thor and Thor: The Dark World, both movies remained lesser efforts in the greater Marvel Cinematic UniverseWhen it first began in 2008 with a little film called Iron Man no one suspected the empire that would follow. Superhero movies in the past, especially those not featuring either Batman or Superman, were usually terrible. And yet, Iron Man would lead to a long series of successful films, launching the most successful cinema brand in history: the Marvel Cinematic Universe. canon. To be one of the top-tier heroes, Thor was going to need a great movie that really played to the strengths of the character (and actor Chris Hemsworth). And then Marvel put out Thor: Ragnarok and gave us the Thor movie we always needed. 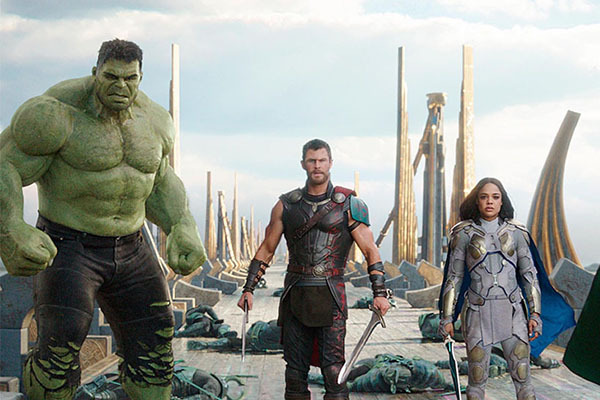 The first two films in the series played to the fantasy elements of the character (and his home setting, Asgard), but Ragnarok largely gets the fantasy beats out of the way early. The intro section see Thor go home to Asgard, finding his brother, Loki (Tom Hiddleston), sitting on the throne, pretending to be their father, Odin (Anthony Hopkins). Thor strong-arms Loki into taking him to their father, who apparently has been living in Norway (back on Earth). The two get to Odin right before he dies (of old age), but with his life gone so, too, goes his magic. That's when the real threat of the movie comes in: Hela (Cate Blanchett), Thor's sister and the goddess of Death. Odin had trapped her in a prison dimension for thousands of years, but with the king dead she's once again free. Hela casts Thor and Loki into an outer world, presumably never to be seen again, while she takes over the throne. Thor and Loki aren't dead, though, just stick on a crap-hole world. Thor is conscripted into that world's fighting pit and forced to go up against the current reigning champion: the Incredible Hulk (Mark Ruffalo). Soon, those two are working together and are joined by a fallen Valkyrie (Tessa Thompson), all so they can work together, get back to Asgard, and stop Hela before she takes over the entire universe. While that summary neatly describes the basics of the plot of Ragnarok, it doesn't really sell the humor of the movie. Ragnarok is easily the funniest, wittiest movie in the whole MCU. Directed by Taika Waititi, the film plays to his specific strengths as a comedy force (as illustrated in many of his past works, including his most famous, What We Do In the Shadows). Every scene, every shot abounds with comedy -- sight gags, jokes, deadpan performances -- that keep the story light, energetic, and enjoyable. If the film resembles any other in the MCU, it's Guardians of the Galaxy. In both cases the films feature bright, candy-colors aesthetics as we follow the adventure of a big, dumb hero. Instead of the Guardians, Thor brings together his team of "Revengers", but the arc is still pretty similar -- outcasts and losers who have their own inner strengths if they could just get out of their own way. This film owes a debt to that earlier Marvel film, not just in establishing that comedic movies like this could work in the MCU but also by already having the sci-fi space themes set up ahead of time. Without Guardians, Ragnarok would have had to spend a lot more time in table setting, crafting the world of the movie instead of having a nice, lean, amusing story. Of course, it helps that the entire cast is game for an amusing affair. It cannot be emphasized enough that Chris Hemsworth is a card, a man born with fantastic comedic timing and the ability to sell jokes with his natural charm. Hiddleston this time gets to really play off this side of Thor, being an amusing doofus in his own right, allowing the two actors to get plenty of good scenes together. Ruffalo, too, gets to be pretty funny once the Hulk alter-ego is shed and he gets to be the nebbish Bruce Banner once more. And there's the new Valkyrie, brought to the screen by Thompson with verve, energy, and physical comedy charm (the fact that she and Hemsworth are the leads in the upcoming MiB International gives me solid hope for that film). About the only actor in the movie not playing their character for laughs in Cate Blanchett. This works to her advantage, though, as she gets to be the straight man to this whole affair. She brings the necessary gravitas to her role as the heavy, Hela, and she's clearly having the time of her life in every one of her scenes. This is a role where she gets to vamp, chew scenery, and be as evil as she wants, and the actress is more than up for the task. She's one of the greats, and to have her in this role make Hela one of the better MCU villains without question. 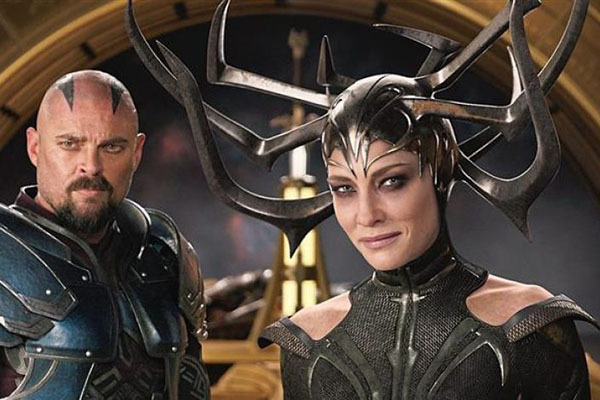 It's really a credit to Blanchett that Hela works at all -- in anyone else's hands it's easy to see this character being just as one-note as the Dark Elves in Thor: The Dark World. Hela is an underwritten character, a villain retconned into the mythology of the movies without any previous reference to her at all. She shouldn't work, shouldn't be someone that should seem like a threat, and certainly not someone that we could get invested in. And yet, because of Blanchett, this mid-tier, also-ran villain steps up into the big leagues. She's awesome. Of course, the movie also does a pretty good job of rewriting Thor into a character that plays properly to Chris Hemsworth's strengths. This isn't the dour and aggressive Thor from the first film, and the pensive and pining Thor from the second. Here he's a big doof, but one that's always eager to get back on mission, back to his home to stop the next fight. He has a solid, indisputable core of good, the heart of a hero (if you will), and he's willing to let the universe take him where he needs to go, comfortable in the knowledge that, eventually, he'll win the day. 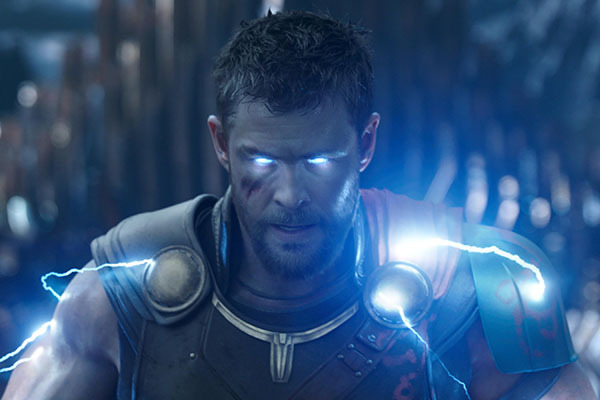 He's the God of the Thunder, more than just a guy with a magic hammer, and the film gets us behind him and his adventures, trials, and tribulations better than any previous story about him. 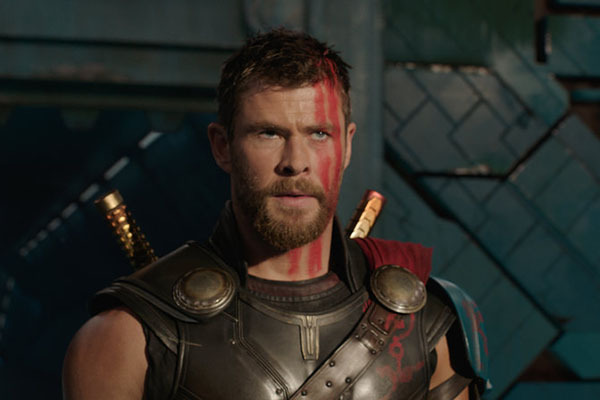 That's the greatest strength of Thor: Ragnarok: in stripping the hero out of his element (even taking his hammer way from him), the movie is able to reinvent the character and give him a very different film than he had before. That's a good thing, because those two films really don't work, not like this third entry. 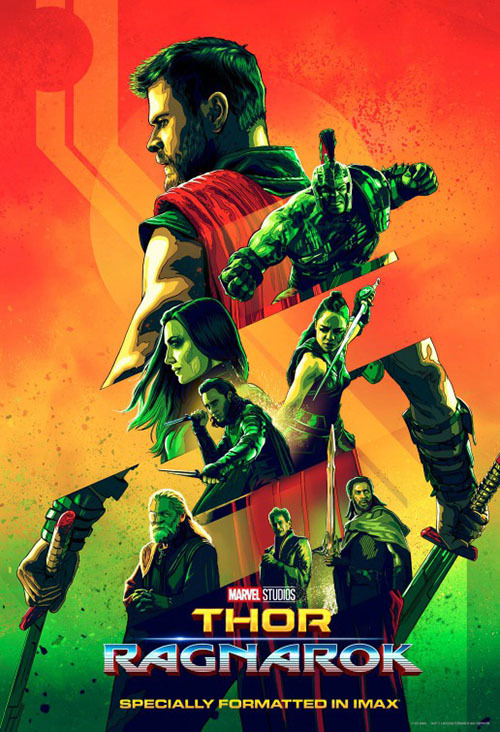 Thor: Ragnarok does such a good job with Thor and his team of heroes it makes you hope there will be further adventures in this series. Thor finally got the movie her deserves and now we deserve even more of them. December 21, 2018: Immigrant Song!